This article is part of our ongoing HR Scenario series by our National HR Client Service Manager, Kim Schaff, SHRM-SCP, PHR. In each of these articles, Kim will walk you through a real-life HR scenario and break down how this situation should be handled and all the ins and outs of the rules and regulations that impact the scenario. For this week’s scenario, let’s look at different reasons an employer may want to reduce an employee’s salary, and whether a reduction would be allowed for that reason. The below response is supported by federal laws and regulations. Specific state laws may further restrict employers from reducing an exempt employee’s predetermined compensation. As a general rule, being paid on a “salary basis” means an employee regularly receives a predetermined amount of compensation each pay period on a weekly, or less frequent, basis. The predetermined amount cannot be reduced because of variations in the quality or quantity of the employee’s work. Subject to the exceptions listed below, an employer must pay an exempt employee the full predetermined salary amount “free and clear” for any week in which the employee performs any work without regard to the number of days or hours worked. There is no requirement that the predetermined salary be paid if the employee performs no work for an entire workweek. Issue # 1) Can an employer reduce an exempt employee’s salary due to a slowdown in business? Consider if this reduction may cause the employee to lose exempt status. Reductions in the predetermined salary of an employee who is exempt will ordinarily cause loss of the exemption. The employee must then be paid minimum wage and overtime required by the FLSA. In some circumstance, however, a prospective reduction in salary may not cause a loss of the exemption. For example, during a business or economic slowdown, provided the change is bona fide and not used as an attempt to evade the salary basis requirements. The employee in this case must still receive a salary of $455 per week. On the other hand, deductions from predetermined pay occasioned by day-to-day or week-to-week determinations of the operating requirements of the business are impermissible deductions from the predetermined salary and would result in loss of the exemption. The difference is that the first instance involves a prospective reduction in the predetermined pay to reflect long term business needs, rather than short-term, day-to-day, or week-to-week deduction from fixed salary. The employer can normally substitute or reduce an exempt employee’s accrued leave (or run a negative leave balance) for the time an employee is absent from work. An employer may do this, even if it is less than a full day, and even if the absence is directed by the employer because of lack of work, without affecting the salary basis payment. This is provided that the employee still receives payment equal to the employee’s predetermined salary in any week in which any work is performed even if the employee has no leave remaining. The employer can seek volunteers to take time off due to insufficient work. If the exempt employee volunteers to take the day(s) off for personal reasons (other than sickness or disability), salary deductions may be made for one or more full days of missed work. The employee’s decision must be completely voluntary. Physicians, lawyers, outside salespersons or teachers in bona fide educational institutions are not subject to any salary requirements and deductions from the salary or pay of such employees will not result in loss of the exemption. Issue #2) Can an employer reduce an exempt employee’s salary when they are on jury duty or temporary military duty? An exempt employee’s salary can be offset by the amount the exempt employee received as jury or witness fees, or on temporary military duty. However, the employer is prohibited from further reducing the employee’s salary for these absences. If an exempt employee is on jury duty for one full workweek, no salary must be paid for that workweek. Issue #3) Can an employer reduce an exempt employee’s salary when they are away from work for personal reasons? Deductions from pay are permissible with an exempt employee is absent from work for one or more full days for personal reasons other than sickness or disability. An employer may not reduce the employee’s salary for partial days of work. An employer with a vacation or PTO leave bank, policy, or practice may also reduce an employee’s salary for such full-day OR partial-day absences without affecting the salary basis of payment, if the employee nevertheless receives in payment his or her guaranteed salary. Payment of the employee’s guaranteed salary must be made, even if an employee has no accrued benefits in the leave plan and the account has a negative balance, where the employee’s absence is for less than a full day. Issue #4) Can an employer reduce an exempt employee’s salary when they are absent from work because of sickness or disability? When an employee is absent from work for one or more full days because of sickness or disability, an employer may reduce the employee’s salary in full-day increments in accordance with a bona fide plan, policy, or practice that covers sickness or disability pay. An employer may similarly reduce an employee’s salary when the employee receives salary replacement benefits under state disability or workers’ compensation laws. An employer with a sick or disability plan, policy, or practice may also reduce an employee’s salary for such full-day absences if the employee has not yet become eligible for, or has exhausted all leave under, the employer’s plan, policy, or practice. When an employee takes unpaid leave under the Family Medical Leave Act (FMLA), an employer may reduce the employee’s salary based on the amount of time the employee is absent. Issue #5) Can an employer reduce an exempt employee’s salary for disciplinary reasons? An exempt employee’s salary may be reduced for penalties imposed in good faith for infractions of safety rules of major significance; such a deduction can be equal to a partial day’s wages. When an employer suspends an employee without pay pursuant to a written disciplinary policy for workplace conduct, the employer may reduce the employee’s salary based on the number of full days for which the employee was suspended. Such reductions should be imposed in good faith. Issue #6) Can an employer pay an exempt employee partial salary in the first or final week of employment? An employer is not required to pay the full salary to an exempt employee in the initial or terminal week of employment. Issue #7) Can an employer reduce an exempt employee’s salary during a leave of absence? An employer is not required to pay an exempt employee’s salary for time not worked during a leave of absence under FMLA. An unpaid leave of absence for personal reasons not subject to FMLA would fall into #3 above. Issue #8) Our exempt employee took half a day off to attend a parent-teacher conference. Can an employer reduce his/her salary? You may require the employee to use accrued paid time off or vacation time for this absence (in any increment but courts have endorsed 4-hour or longer increments), but absent a policy or accrued and available time off, you may not reduce an exempt employee’s pay on a day in which any work was performed. See #3 above. Issue #9) An exempt employee has requested a move from fulltime to part-time status. Can an employer adjust the employee’s salary down to compensate for the reduced hours? Yes, the salary can be reduced if the position still meets all the conditions for the particular exemption, including being paid a minimum weekly salary of $455. It is important to remember that this is a one-time reduction in weekly salary that is made upon the conversion to part-time status. The part-time exempt employee must still receive their full weekly salary, which is not subject to reductions because of the quantity or quality of the work. In other words, the part-time exempt employee’s pay may not fluctuate from week to week. The Fair Labor Standards Act (FLSA) allows reductions in employees’ salaries as long as the reductions are not designed to circumvent the salary basis requirement. When an employee is paid less than the minimum salary requirement, his or her position does not meet the FLSA white collar exemption requirements. In such a case, the employee would be paid as a non-exempt employee. 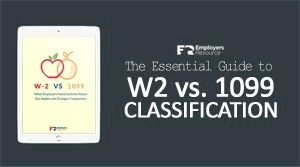 For more information on exempt vs non-exempt employee classification, see our post How Exempt vs. Non-Exempt Classification Works. Worried About Employment Law Compliance?